Nearly 6 months after it was introduced, Apple’s highly-anticipated iPhone goes on sale. Generally downplayed by Old Word Technology pundits after its introduction, the iPhone was greeted by long lines of buyers around the country on that first day. 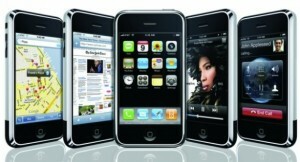 Quickly becoming an overnight phenomenon, one million iPhones were sold in only 74 days. Since those early days, the ensuing iPhone models have continued to set sales records and have completely changed not only the smartphone and technology industries, but the world as well.